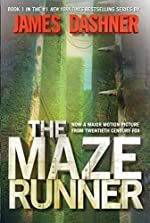 Review: The Maze Runner - A stunning masterpiece by James Dashner. An amazing confluence of suspense, drama, action, and fear that instantly snags in the reader. This being the first in the series, I expect many great things from this author! This is his eighth book, so greatness is pretty much a standard at this point in one’s writing career. Thomas finds himself in a strange place with no memory of how he arrived there. While his memory remains in place about basic life functions, he has lost all personal memory about who he is, or who his parents are. He finds himself in a sort of prison surrounded by a maze with only boys inhabiting the place. All supplies are provided through the same hole Thomas arrived through. The maze, however, is filled with monsters that come out at night and keep the boys from escaping. But Thomas's arrival sets off a chain of events that begin to lead to change. He feels determined to discover the answer to the maze and puts himself at great risk to find out how they can get out from where they are. I was sucked into the book from page one, and just like the main character, I was dying to learn the secrets of the place where they were. The book took turns I wasn't expecting and kept me in plenty of suspense! The pacing is quick and the world Dashner has created is very interesting and different. There's plenty of mystery beyond the maze and this, the first book in the series, gives us just a beginning glimpse into the state of the world. Sometimes, the reader might think that something is expected, thanks to the clues given by the author. However, the book is too full of surprises to think that anything is expected! The book does end on a sudden note, but it is book one of the series, so more surprises are yet to come! It's possible that the emotional landscape of the characters could have been more fully developed, but overall this is the perfect book to lose yourself in! Things You Might Want to Know: Moderate violence, but nothing drastic. Review written by Milosz (8th grade student). We would like to thank Random House for providing a copy of The Maze Runner for this review. Have you read The Maze Runner? How would you rate it? Wow - this sounds like a scary, yet exciting book. Just the word "maze" is enough to get me interested! James Dashner is also the author of The 13th Reality series. Have you read any of these?